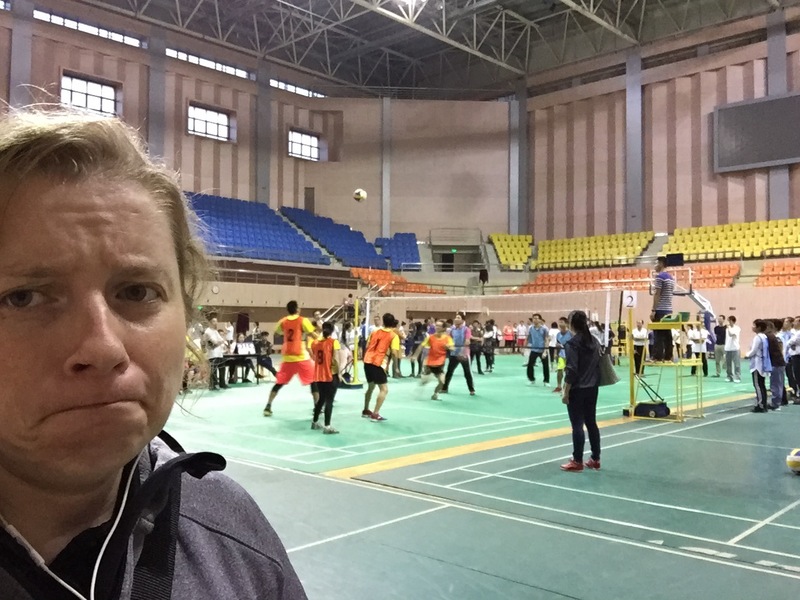 Every week I recap how my week in badminton went. I play three days a week: games with my regular group on Tuesday and Thursday and class with my teacher on Wednesdays. Tuesday was great as usual. Felt good, played good. I was fresh from the weekend, so like normal, it was the best day. In fact, I was winning all my games will the end of the night. Then I lost three successive games. But oh wells. So on Wednesday, class day, I checked in with my teacher at noon, as I usually do, and everything was go for our lessons. Then at 5pm (we meet at 5:30) he sent me a text that said he heard there was a volleyball competition and maybe we couldn’t practice. Now, this is where old Becky would just say “okay, forget it,” and cancel. I’m naturally lazy, and when active plans (in which I know I am going to be dirty and exhausted afterwards) fall through and I can just stay home and relax I feel secretly relieved. I usually would be happy to do the thing planned, like a hike up a mountain when the weather is hot, but if it didn’t work out for some reason, I’m usually secretly relieved and fire up the Netflix. But as soon as my teacher said the gym was busy, I felt outraged. Not on MY night! “What can we do?” I asked my teacher. “Maybe there are some open courts next to the volleyball ones?” It’s a big gym and there was no way a volleyball game could use up the whole space. Maybe they had left up a few badminton nets and we could practice. “Guess we’ll have to take a break today,” my teacher texted back when I told him the news. I sent several of the cry face emojis back saying okay. And here’s the thing, I was really upset. I wasn’t happy to have more free time, or have a chance to relax. I felt like I was making out with a super hot guy and we got interrupted right before we got to the good part. I had badminton blue balls. Not a single part of me was secretly relieved. Sure, I didn’t have sore legs or sweat through my clothes which was nice. I also saved some money on the class. But none of that consoled me. I wanted to sweat. I wanted to pay the money. I wanted to play badminton dammit! And that has never happened to me before. Inconsolable because I couldn’t run around sweating, playing a sport?! Who have I become?! A super weirdo and nothing resembling the self I am so familiar with. Thursday was more awesome than normal because I didn’t have my weekly exhaustion. I played well and hard and the last game of the day I rolled my ankle. It hurt like hell, but made me so proud! A rolled ankle is one of the most common badminton injuries, and it happened to me! I’m a badminton player! A real badminton player! Also, I was kinda waiting for an injury, dreading it, and now it happened I feel good to have it over with. I iced it and two days later it was fine, but I think I’ll play with a brace next week just to be safe.